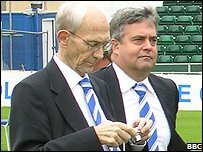 Bristol Rovers have appointed Nick Higgs as chairman in place of Ron Craig, who has held the post for the last 16 months. Craig has decided to hand over the reigns to his younger vice-chairman but will remain a club director. "It makes me very proud. My family have all been Rovers fans," Higgs told BBC Radio Bristol. "Ron has done a fantastic job, it's going to be a tough act to follow. I feel very excited about things." "In 16 months he's had a Wembley final, promotion, quarter finals of the FA Cup and in that period we've also obtained planning permission for a new stadium," he continued. "The stadium is very close to my heart, with my background in the construction industry. "I've always wanted to see Rovers run out into a new stadium and obviously that's going to be one of my main priorities. "We're getting on quite well so we're really hopeful that things will be back on track before long." Craig's tenure was marred by the redevelopment of the Memorial Stadium twice being delayed.